Samsung Electronics promoted Kwon Oh-hyun, a resigning vice chairman, to chairman of the firm‘s research entity in a follow-up reshuffle of its executives on Thursday aimed to further stabilize the organization. Two other former CEOs Yoon Boo-keun and Shin Jong-kyun were also promoted to vice chairman of the firm’s external corporate relations and vice chairman responsible for fostering the firm’s future leaders respectively, a measure considered as a symbolic gesture recognizing the contribution of the receding former leadership. The latest reshuffle, coming two days after the appointment of new leaders in key divisions, is seen by industry watchers as the group’s effort to settle down amid a leadership vacuum. Samsung also promoted several senior executives to higher levels. They include Tim Baxter, who is now corporate president and CEO of Samsung Electronics America and Jin Gyo-young, president and head of memory business. Tim Baxter is a sales and marketing expert, according to Samsung. He joined Samsung Electronics’ US division in 2006 after working for AT&T and Sony. He has since built an extensive record of success at the company in growing revenue and brand value for both the consumer electronics and mobile businesses. Jin Gyo-young has experience in the development of memory technologies and boats expertise in memory process architecture and DRAM product development, the firm said. Kwon Oh-hyun, who had announced to step down from all of his posts on Oct. 13, will be heading Samsung Advanced Institute of Technology. Joining Samsung in 1985 and running the chip division since 2012, Kwon has made Samsung the world’s largest chip maker outstripping former chip giant Intel. 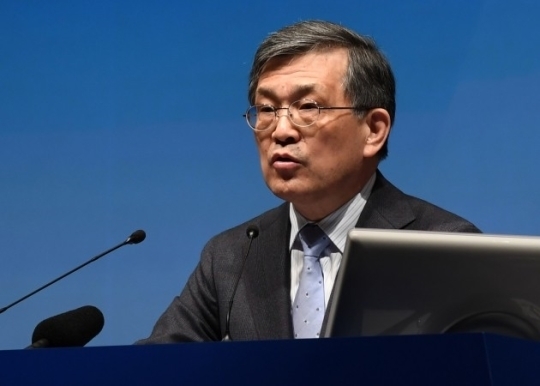 Kwon was the only person holding a vice chairman title at the group since former Vice Chairman Choi Jee-sung, who is also jailed over bribery, resigned earlier this year. He steered the group in Lee’s absence and represented Samsung at events including a meeting with President Moon Jae-in. Samsung said his expertise will help guide future technology development. “The former heads, in recognition of their invaluable contributions to Samsung Electronics’ success, will remain within the Company with more senior executive titles,” a Samsung’s spokesperson said upon the announcement. The three former heads will not be involved in the company’s daily operations, but will leverage their knowledge and insights to advise the current management team, the firm added. “Although the new chairmen will work as advisors, the promotion of the former heads proves what Samsung now wants is stabilization and not dramatic change amid a leadership vacuum,” said Park Ju-gun, head of research firm CEO Score.